Since so few people appear knowledgeable about public affairs, one might question whether collective policy preferences revealed in opinion surveys accurately convey the distribution of voices and interests in a society. 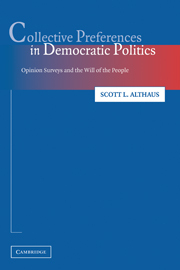 Scott Althaus' comprehensive analysis of the relationship between knowledge, representation, and political equality (in opinion surveys) leads to surprising answers. Knowledge does matter, and the way it is dispensed in society can cause collective preferences to reflect opinions disproportionately. Accordingly, the study can help survey researchers, journalists, politicians, and concerned citizens better appreciate the problems and potentials of the usage of opinion polls to represent the people's voice. 1. Introduction; Part I. Illusions of Aggregation: 2. The power of noise; 3. Who speaks for the people? ; Part II. Information Effects in Collective Preferences: 4. The impact of information effects; 5. The structure and causes of information effects; 6. The temporal dynamics of information effects; Part III. Opinion Surveys and Democratic Politics: 7. Opinion surveys and the will of the people; 8. What surveys can tell us about public opinion.